Even in this economy, teams continue to give and take max contracts left and right, yet there is a clear divide between a max player who can bring you to the playoffs and one who could compete for a championship. 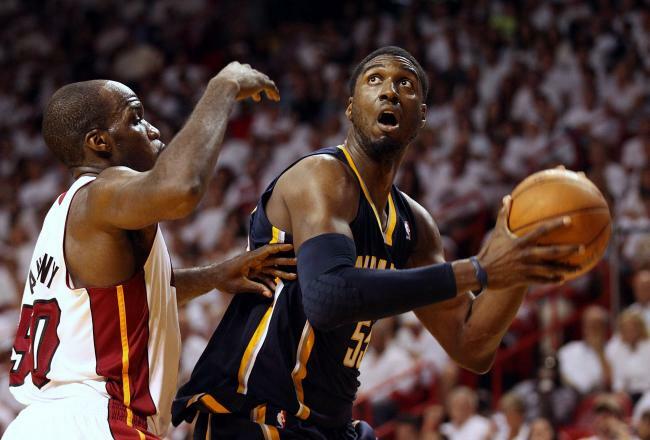 After hearing that Roy Hibbert was offered a max deal, it is time to analyze the guys getting top dollar. As you can see below, the definition for a max contract can be quite complicated, so I decided to settle on the top 24 salaries of last year. The same face Roy must have had after being offered a max contract. The maximum amount of money a player can sign for is contingent on the number of years that player has played and the total of the salary cap. The maximum salary of a player with 6 or fewer years of experience is either $9,000,000 or 25% of the total salary cap (2010–11: $14,511,000), whichever is greater. For a player with 7-9 years of experience, the maximum is $11,000,000 or 30% of the cap (2010–11: $17,413,200), and for a player with 10+ years of experience, the maximum is $14,000,000 or 35% of the cap (2010–2011: $20,315,400). Under the 2011 CBA, maximum salaries, as expressed as a percentage of the cap, remained mostly unchanged. However, a player coming off his rookie scale contract is eligible to sign for 30% of the cap if he appeared in two All-Star Games, was named to an All-NBA Team twice, or was named MVP. This was dubbed the "Derrick Rose Rule" after the 2011 MVP. In addition, newly signed contracts now have a maximum duration of five years for players with Bird rights and four years for all other players (including sign-and-trade acquisitions). Every team is allowed one "designated player" who receives a five-year maximum extension on his rookie scale contract. Of these 24 players, only ten have championships and play for a total of five different teams. The Lakers and Heat both needed three top-paid players to win it all, while the Celtics had two, and the Spurs and Mavs both had one max player respectively. Clearly the trend is that you need multiple top-paid players to win it all, but we all know not all top players are deserving of top money. Props to Dirk and Timmy for delivering championships as the clear alpha dog. You can argue that both had solid players around them, but their supporting cast didn't include the likes of Gasol, Wade, or Paul Pierce. If anything, this tells you how important a solid PF still is in today's game. Only four players failed to make the playoffs, including Brandon Roy, who actually retired at the start of last year. The verdict is still out on Deron Williams, since he has proven in the past to be able to carry his team to the playoffs. But when it comes to Antawn Jamison and Rashard Lewis, I am going to just go out and claim them to be the most overpaid players in the league. Jamison is past his prime and was never a leading man on any team. Rashard Lewis is the poster child of irresponsible spending -- this guy was never a consistent All-star and got a contract purely on potential. Of the players who have not won championships, only four show true potential of winning a championship. I know Mok will disagree, but I put Dwight Howard in this group as well as Chris Paul, Deron Williams, and Kevin Durant. I agree that Dwight Howard wouldn’t be able to do it himself, but if he were to end up on a team with Josh Smith and Chris Paul in Atlanta, I would say his chances would rise drastically. These four are great at only one end of the floor: offense. One could argue that Dirk Nowitzki is an example of this type of player being able to succeed, but I set him above the rest because of his ability to become an offensive mismatch for any defender at the 3, 4, and 5 spots. I believe Carmelo and Amare could be on a championship team, just not if they are on the same team. Joe Johnson broke headlines this week with his trade to the Brooklyn Nets, yet everyone must be wondering why their team would take on four years and about $90 million dollars. If you’re a Nets fan, you better be praying that Deron Williams asked for Joe Johnson by name and that both Dwight and Deron end up playing their home games in Brooklyn next year. Otherwise, you will be having the same regret Atlanta had to live with for two years. I call this group the "Regular Season All-Stars" because that’s exactly what they are and only will be. They won’t carry your team in key moments; most of their best moments will be in a meaningless game against bad teams. The big moment simply overwhelms them, so if one of these men is your team's best player, forget about winning a championship -- the killer instinct just isn’t there. I used to put LeBron in this category until something changed in the last two games of the Celtics series. Maybe he finally realized Wade isn’t the closer people claim he is. In the end, teams need to stop throwing max money at incomplete players, or players that fail to come through in big moments. Instead, let another team pay the guy because it is better to make the playoffs and lose with financial flexibility than watch the same overpaid team get bounced early in the playoffs over and over. Amare is the most overpaid player on that list, basically a rich man's Mau Taylor, and you still have to pay him for 3 more years. I think Dallas has completely shattered your theory this year, where has their financial flexibility gotten them? In the current era of the NBA, teams sometimes have to overpay certain players to attract others (it could be argued that the Joe Johnson signing made DWill stay in Brooklyn). If you are not contending for a championship, it's better to tank and hope to get a stud on a 5 year rookie contract. It's all about super teams now. Stern getting his wish!